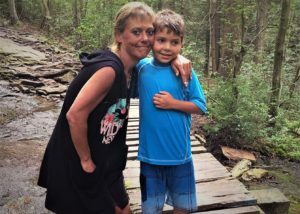 Gender Odyssey welcomes Kristie Maldonado and her son, Joe! 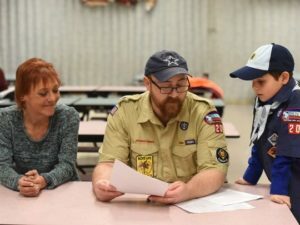 This year, Joe became the first openly trans boy to be inducted into the Boy Scouts. Together, this family continues to advocate for trans people everywhere. Kristie recently connected with guest blogger Nathan Tabak. What makes this year’s Gender Odyssey conference important to you, particularly given current events? all transgender people. And finding out from other parents that we’re encouraging other organizations to change to be more welcoming of trans people is so important. It’s amazing to know that we opened the doors for so many. I want to tell everyone in the trans community: regardless of how old you are, always speak your mind and you can make a huge change. I’m very supportive of my child—more parents should be more supportive and accepting of trans kids. Joey was always very strong-minded, and going through this fight has made him even stronger. It feels great to get so much support from others. It was amazing to see Joe get honored with multiple state awards in New Jersey. And most recently, San Antonio’s Pride parade even made him a grand marshal. How does Joe feel about attending Gender Odyssey? Meeting other trans people makes Joe feel good and proud that he made this change. He’s just so proud that he was able to do this. He really believes that he has every right to be in the Scouts; he just wants to be treated like everyone else, and I want him to be treated like anyone else. What lessons do you hope to take back from the conference to your community? It’s important to me that people know that things are changing, and that we can make a change. In New Jersey, our governor just signed into law legislation to protect trans students’ rights. But we also have a lot of work to do. Many other states are still behind on trans rights, and we definitely need to make more changes. Joey is not at all happy with the Trump administration, and I agree. What are his priorities? Why is he singling out the trans community for discrimination, with everything else going on in this country? You have been a courageous advocate for Joe, and must be busy. It is great that you will be able to join us at conference this year. Joe and I are really excited to attend Gender Odyssey for the first time; we want to share our story. I especially want to tell other parents to fight for their kids; I wish more parents would do what I did in standing up for who my child is, because too many people didn’t. Many family friends ended up shunning us because of who Joe is. That was a rough time. I found a support group for parents of trans kids, and that was incredibly helpful in getting through that. For Joe, it’s always an amazing experience to meet other trans kids. Two weeks ago, Joey went to a camp in New Hampshire just for transgender and gender-nonconforming kids—he said he had a phenomenal time. I’m so glad I didn’t walk away and that I fought for my child. Joe has every right to be in the Boy Scouts like any other kid. In those situations every parent should stand up for who their child is. At San Antonio Pride, we chose this banner for Joey: one little star can light up the sky. It couldn’t be more appropriate. I’m so proud that so many people heard my child’s voice, and that he’s made a real difference for trans people around the country. Join the conversation! Tickets to Gender Odyssey are still available. Washington State Convention Center. Professionals: August 23-24. Families, Individuals, Community Members: August 25-27. You can also join our FREE community events throughout the conference! This entry was posted in Blog and tagged Activists, Boy Scouts, Conference, Spotlight, Transgender Child. Bookmark the permalink.